Bizarre claims about ancient history were nothing new to the newspapers of the early twentieth century, and this entry, provided to a wide array of British and American newspapers on July 30, 1922 by William Randolph Hearst’s International Feature Syndicate, was one of many. It is notable because the so-called expert cited as the source was a known medical quack and not an Egyptologist. His claims are very lightly rewritten from the medieval Arab pyramid myth, to which he has give a more overtly biblical flavor. Because the original illustrations are intertwined with the text, I have reproduced the whole page below (courtesy of the Library of Congress), with a transcript beneath the image. 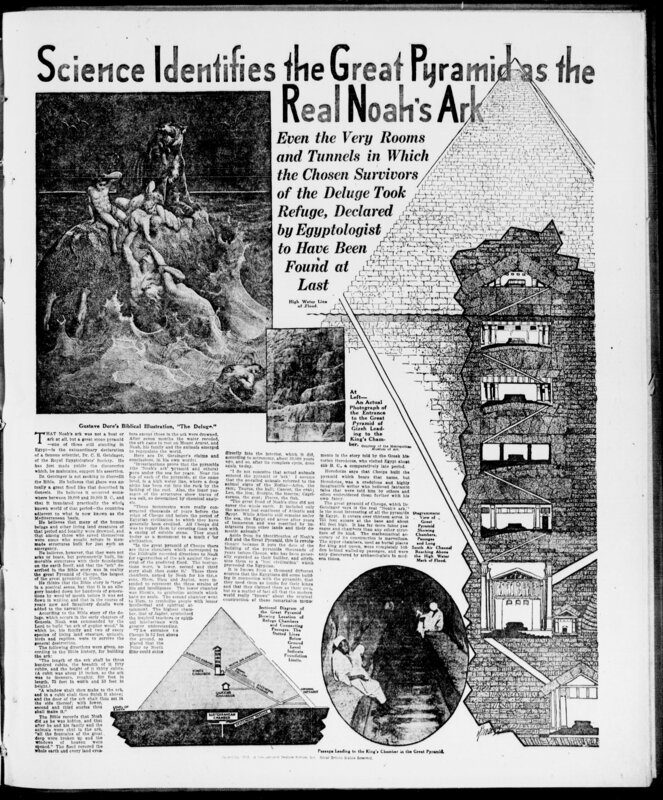 ​That Noah's ark was not a boat or ark at all, but a great stone pyramid--one of those still standing in Egypt--is the extraordinary declaration of a famous scientist, Dr. C. E. Getsinger, of the Royal Egyptologists’ Society. He has Just made public the discoveries which, he maintains, support his assertion. Dr. Getsinger Is not seeking to discredit the Bible. He believes that there was actually a great flood like that described In Genesis. He believes It occurred somewhere between 20,000 and 30,000 B. C., and that it Inundated practically the whole, known world of that period--the countries adjacent to what Is now known as the Mediterranean basin. He believes that many of the human beings and other living land creatures of that period and locality were drowned, and that among those who saved themselves were some who sought refuge in man made structures built for Just such an emergency. He believes, however, that they were not arks or boats, but permanently built, immovable structures with their foundation on the earth Itself, and that the “ark” described In the Bible story was in reality the great Pyramid of Cheops, the largest of the great pyramids at Glzeh. He thinks that the Bible story is “true” in a poetical sense, but that it is an allegory handed down for hundreds of generations by word of mouth before It was set down in writing, and that in the course of years new and Imaginary details were added to the narrative. According to the Bible story of the deluge, which occurs in the early chapters of Genesis, Noah was commanded by the Lord to build “an ark of gopher wood,” in which he, his family and two of every species of living land creature, animals, birds and reptiles, were to survive the general destruction. The Bible records that Noah did as he was bidden, and that after he and his family and the animals were shut in the ark, “all the fountains of the great, deep were broken up and the windows of heaven were opened.” The flood covered the whole earth and every land creature except those in the ark were drowned. After seven months the water receded, the ark came to rest on Mount Ararat, and Noah, his family and the animals emerged to repopulate the world. “Investigations prove that the pyramids (the ‘Noah’s ark’ pyramid and others) were under the sea for years. Near the top of each of the pyramids, at the same level, is a high water line, where a deep niche has been cut into the rock by the lashing of the surf. Also, the inner passages of the structures show traces of sea salt, so determined by chemical analysis. “These monuments were really constructed thousands of years before the reign of Cheops and before the period of Egyptian civilization to which they have generally been credited. All Cheops did was to repair them by covering them with a casing of outside stone. They stand to-day as a monument to a much earlier civilization. “In the great pyramid of Cheops there are three chambers which correspond to the Biblically recorded directions to Noah for construction of the ark against the arrival of the predicted flood. The instructions were, ‘a lower, second and third story shalt thou make it.’ These three chambers, named by Noah for his three sons, Shem, Ham and Japhet, were Intended to represent the three strains of life and intelligence. The lower chamber was Shem’s, to symbolize animals which have no souls. The second chamber went to Ham, to symbolize people with lesser intellectual and spiritual attainment. The highest chamber, that of Japhet, symbolized the inspired teachers or spiritual intellectuals with greater understanding. “The entrance to Cheops is 52 feet above the ground, so placed that the Polar or North Star could shine directly into the interior, which it did according to astronomy, about 30,000 years ago and so, after its complete cycle, does again to-day. “I do not conceive that actual animals entered the pyramid or ‘ark.’ I assume that the so-called animals referred to the animal signs of the Zodiac--Aries, the ram; Taurus, the bull; Cancer, the crab; Leo, the lion; Scorpio, the insects; Capricornus, the goat; Pisces, the fish. Aside from its identification of Noah’s Ark and the Great Pyramid, this is revolutionary because it puts the date of the building of the pyramids thousands of years before Cheops, who has been generally regarded as their builder, and attributes them to a “lost civilization” which preceeded the Egyptian. It Is known from a thousand different sources that the Egyptians did some building in connection with the pyramids, that they used them as tombs for their kings and that they claimed them as their own, but as a matter of fact all that the modern world really “knows” about the original construction of these remarkable monuments Is the story told by the Greek historian Herodotus, who visited Egypt about 450 B. C., a comparatively late period. Herodotus says that Cheops built the pyramid which bears that name, but Herodotus, was a credulous and highly imaginative writer who believed fantastic tales that were told him by others and often embroidered them further with his own fancy. The great pyramid of Cheops, which Dr. Getsinger says is the real “Noah’s ark,” is the most interesting of all the pyramids in Egypt. It covers over thirteen acres, is 755 feet square at the base and about 481 feet high. It has far more inner passages and chambers than any other structure of its kind. The mathematical accuracy of its construction Is marvellous. The upper chambers, used as burial places for king and queen, were completely hidden behind walled-up passages, and were only discovered by archaeologists in modern times. Source: Tulsa Morning World, July 30, 1922.